The Vampire Facelift is a procedure to healthy, youthful, and rejuvenated skin, but done quickly and without surgery. This procedure is able to do this by using your own body’s healing and regeneration properties. The Vampire Facelift is a clinic procedure, and results can be experienced on the same day, with continual benefit of skin rejuvenation lasting for months—even over a year—after the procedure. The Vampire Facelift is actually not a surgical facelift at all, but rather a type of skin treatment using the body’s own natural healing and growth factors that are derived from your own blood (hence the name The Vampire Facelift ), combined with a hyaluronic acid dermal filler. The procedure is a near painless series of injections into strategic areas of the face to reduce wrinkles, add youthful volume, and improve the quality of your skin. The platelet solution is placed after a numbing cream has been applied, resulting in a near painless application. Platelet solution contains at least eight of the body’s own concentrated growth factors to rejuvenate the face in several ways. Increases the blood flow to the skin, resulting in healthier and flawless skin. Causes production of new collagen, the major component of facial skin that decreases in facial aging. Activates the stem cells in the skin, resulting in the generation of new, younger-skin. The Vampire Facelift procedure only takes about an hour to complete, and that includes the: blood drawn, preparation of the PRP, platelet-rich fibrin matrix, and The Vampire Facelift treatment itself. 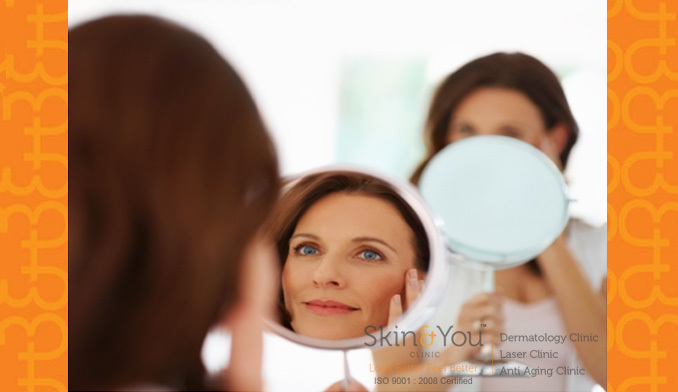 Since skin renewal and rejuvenation is using the body’s own active regeneration components, facial skin renewal is continual for about 3 months after the procedure. The overall effects of the Vampire Facelift can last for over a year. Who can do the facelift? The Vampire Facelift is for everyone. People with more advanced signs of aging may benefit more by adding Botox applications. People with less visible signs of aging may benefit from using less extensive non-surgical procedures like hyaluronic acid fillers and platelet-rich plasma alone. Why Skin & You Clinic for vampire face lift? At Skin & You Clinic, we have done a number of procedures with excellent results. The procedure is safe with minimal downtime. We understand the anatomy of the face and know what is needed to achieve a youthful face.